ATLANTA (AP) — What is the most valuable fruit crop produced in the Peach State? This is not a trick question, but you may want to pause a second before answering. Georgia is famous as a major producer of the peach, the fuzzy succulent orange fruit whose image appears on state license plates, "welcome to Georgia" billboards and on road signs. When driving in the capital city of Atlanta, you can pass the corner of Peachtree Street and Peachtree Center Avenue, just one block from West Peachtree Street. There's just one problem: Blueberries are Georgia's most lucrative fruit crop, by far. In a little-noticed development, the value of blueberry production in Georgia beat the peach crop in 2005 — and the gap has grown even bigger since then, according to U.S. Department of Agriculture surveys. Blueberries generated an estimated $94 million for Georgia growers in 2012, meaning the blueberry crop was more than three times as valuable as the nearly $30 million peach crop. "It's surprising around the country how many people don't realize Georgia grows blueberries," said Joe Cornelius, chairman of the Georgia Blueberry Commission and a farmer who grows about 170 acres of the crop. He refuses to gloat about surpassing his fellow peach farmers. "I don't foresee Georgia changing to the blueberry state." Analysts and growers say a combination of supply-and-demand economics coupled with a good growing environment propelled blueberries from a tiny crop to a profitable niche that dwarfs the famed peach. Blueberries used to make up a relatively small percentage of the state's fruit crop. But major blueberry producers, particularly in Michigan, were searching for ways to get berries on the supermarket shelves earlier in the year. They signed deals with growers in Georgia since the state starts harvesting its berries in April, ahead of other producers except Florida and California, said Scott NeSmith, a horticulturist at the University of Georgia who studies blueberries. Other climate factors help, too. While blueberry-killing frosts are possible in Georgia, they are not frequent. Celebrated by physicians and nutritionists for their antioxidant qualities, blueberries have grown greatly in demand among health-conscious consumers. 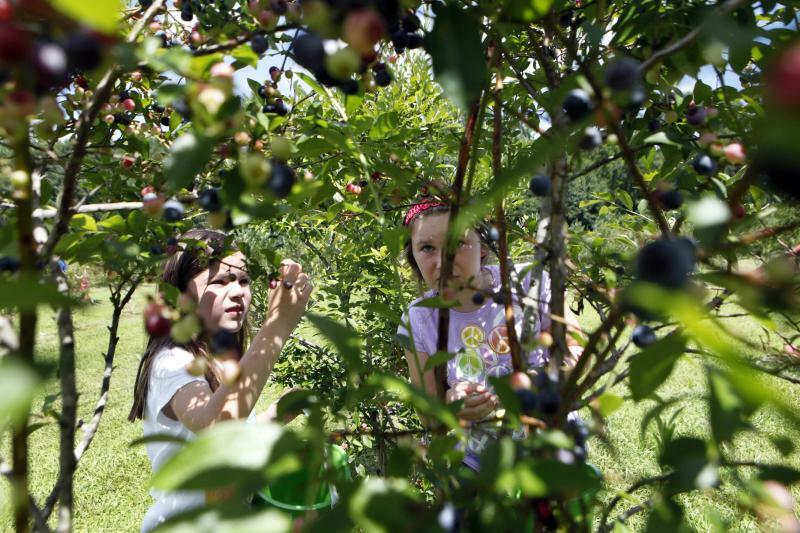 Farmers say it greatly expanded the public's appetite for the berry. Average prices have jumped from 48 cents a pound in 1993 to $1.34 in 2012, and the growth was among one of the main factors prompting farmers to plant larger and larger numbers of blueberry bushes. It only takes three or four years for the bushes to reach full production. Since prices hit a peak in 2007, many of the new blueberry fields planted by farmers seeking lucrative prices are now entering full production. And as supply has increased, prices have decreased. "We're probably nearing the peak, I feel," said Bradley Vickers, 28, a blueberry farmer from rural Nashville, Ga. "I hope it continues to be profitable for my sake and everyone else's." Another reason blueberries have proliferated to such a degree is that Georgia farmers are searching for alternatives to traditional Southern crops such as tobacco and timber. Tobacco production has trailed off as Americans smoke less, and the timber industry took a big hit when the Great Recession slowed home building. Vickers is one of those farmers. As of now, he still makes more money from tobacco, and sometimes cotton and peanuts. But he thinks blueberries probably have better long-term prospects than tobacco. "If they begin to go down —and tobacco is probably one of those things — I have something to replace that, in case we need it," he said. Georgia is not the biggest U.S. peach producer, and is regularly beat by California and neighboring South Carolina. Its reputation for peaches was always one part reality and one part marketing. The Civil War left the Southern economy in ruins and ended slavery, which meant it was no longer possible for white farmers to produce cotton and other labor-intensive cash crops with cheap slave labor. One alternative was peaches. Samuel Rumph, a 19th century grower in Georgia, was a major innovator, commercializing a tasty and robust variety called the Elberta, named for his wife. Perhaps more important, he developed a refrigerated rail car, making it possible to ship Georgia peaches to larger markets in Boston, Philadelphia and New York. As a result, Northern customers started associating Georgia with peaches. "He had a great product. He didn't have a way to get it to market," said Will McGehee, a fifth-generation peach grower and the marketing director for the Georgia Peach Council. "And the refrigerated rail car was the answer. And so finally you were able to connect demand and supply."